The Slack integration allows you to post event updates to a Slack room. To configure the integration, add your incoming webhook URL, followed by the channel name (including the hash key), the sender name, and finally an emoji (the name) to include with the notification. 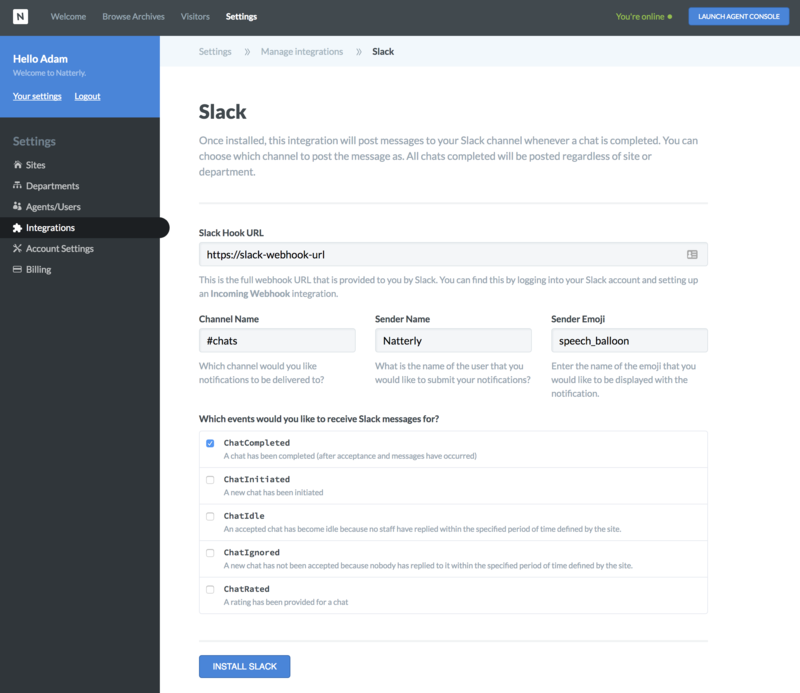 Once you configured your integration, you can choose from a list of events to receive Slack messages for. ChatCompleted - A chat has completed (after acceptance and messages have occurred). ChatInitiated - A new chat has been started. ChatIgnored - A new chat has not been accepted because nobody has replied to it within the specified timeout period for the site. ChatIdle - An accepted chat has become idle because no staff have replied within the specified timeout period for the site. ChatRated - A rating has been provided for a chat.